Sew Inspired: 101 Patchwork Projects + Quilts!! 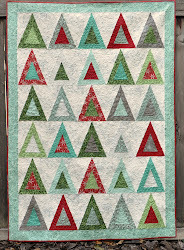 I was so excited to get an email about 101 Patchwork Projects + Quilts this morning! 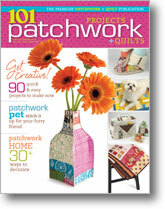 If you haven't heard about it, it's a new magazine published by Interweave, the amazing folks behind lots of cool magazines including Quilting Arts and Stitch. I had been wondering what the cover would look like... isn't it pretty? You'll be able to get your own copy on newsstands in just a few weeks, or you can preorder it here. You can also get a sneak peek of the table of contents, and see photos of 2 of my 3 projects that are included in this issue! Ok I'm going to call my mom now, and tell her about this. Happy Thursday! That is so very cool, Vicki! I am proud of you for your beautiful work. Congratulations! that is great!! i'll have to pick up a copy next time I'm out! Looks like a jam-packed issue! Congrats on being a featured quilter. They use both of your projects as photos on the Table of Contents too! How wonderful! You should be so proud of yourself -- how great to have your gorgeous work recognized like that. Yay you!